For other people named Adam Reed, see Adam Reed (disambiguation). 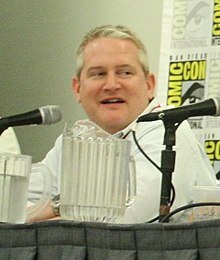 Adam Brooks Reed (born January 8, 1970) is an American voice actor, animator, writer, producer and television director. Reed created, writes, and voice acts the FX adult animated comedy series Archer, which premiered in September 2009. He also voice acted, wrote, directed and produced the television series Sealab 2021 and Frisky Dingo, with his co-creator and partner Matt Thompson. Reed graduated from the University of North Carolina at Chapel Hill in 1992 with a degree in English. Reed and longtime collaborator Matt Thompson started out at Cartoon Network doing various odd jobs as production assistants, until they came up with their own show, High Noon Toons, in 1994. High Noon Toons was a 3-hour programming block of cartoons hosted by cowboy hand puppets Haas and Lil' Jo (a Bonanza pun). Thompson and Reed were frequently drunk during filming. Once in 1995, the duo was reprimanded for lighting one of the prop sets on fire. After leaving Cartoon Network in 1996 (over disagreements while working on a morning cartoon show hosted by Carrot Top), Reed and Thompson moved to New York, where they would spend a year working in the "sordid underbelly" of daytime talk shows. Reed and Thompson formed 70/30 Productions when they created Sealab 2021, one of the first original series for Adult Swim. The company's name came from the plan that Reed would do 70% of the writing and 30% of the producing, with Thompson doing the reverse. The pair became renowned for their work on a number of other Adult Swim projects, including Frisky Dingo, which aired for several years after Sealab 2021 was cancelled. In 2009, Reed and Thompson closed 70/30 Productions and formed Floyd County Productions to produce Reed's new project, the FX Network series Archer. They have since grown the company from a small eight-person studio into one of the most competitive and sought after animation houses in the industry. Floyd County not only develops exclusive programming but also creates content for other media. Including the television shows Atlanta, Legion, Fargo, Goliath and It’s Always Sunny in Philadelphia. After the cancellation of Frisky Dingo in 2008, Reed took a vacation to Spain to brainstorm ideas for a new project. His experience traversing the Vía de la Plata, and people watching in Plaza Mayor in nearby Salamanca, enabled him to conceptualize his vision of Archer. Reed recalled in an interview, "So I sat on the Plaza Mayor for three days—drinking either coffee or beer or gin, depending on the time of day—surrounded by these Spanish women who seemed both unaware and completely aware of their beauty. Occasionally they would glance over—and catch me gaping at them—and just smile at me like, 'I know, right?' And for three days, I couldn't even splutter 'Buenos dias' to any of them—not once. And thus was Sterling Archer born—he would've absolutely sauntered over to a table full of those women and sat down and ordered an entire case of cava or whatever." Nevertheless, he believed developing a sitcom with the theme of global espionage was inevitable given his proclivity for adventure-driven comedy. Archer, was originally pitched under the working title Duchess. Archer draws inspiration from a variety of sources, including the James Bond franchise, OSS 117: Cairo, Nest of Spies (2006), and The Pink Panther franchise. The show's hallmarks include reference-heavy humor, rapid-fire dialogue, and meta-comedy. Archer is produced using limited animation and takes its visual style from mid-century comic art. The cast members record their lines individually, and the show regularly employs guest actors and actresses for supporting characters. There have been 101 episodes broadcast in the show's history. Archer has received positive reviews from critics and won awards, including three Primetime Emmy Awards and four Critics Choice Awards. The series has also received 15 Annie Award nominations, among others, for outstanding achievement in animation, writing, direction, and voice acting. At San Diego Comic Con 2018, it was announced the tenth season will be titled Archer: 1999. Reed intends to leave Archer after its tenth season, although plans have not yet been finalized for the show's future. ^ "North Carolina, Birth Index, 1800-2000," index, FamilySearch), Adam Brooks Reed, 1970". Familysearch.org. Retrieved 2016-01-09. ^ "Adam Reed, cartoon man of mystery". ^ Atlanta Magazine, Oct. 2005, pg. 140. Books.google.com. October 2005. Retrieved 2014-05-29. ^ "Exclusive: Adam Reed On The Origins Of FX's 'Archer'". Fanbolt. March 3, 2011. Archived from the original on August 22, 2011. ^ a b Reed, Adam (May 14, 2014). "'Archer's' Adam Reed: If Spanish Women Liked Me, I Never Would Have Created This Show". The Hollywood Reporter. Archived from the original on January 10, 2018. ^ Brophy-Warren, Jamin (January 11, 2010). "New FX Series "Archer" Puts an Animated Twist on the Spy Genre". Wall Street Journal. Archived from the original on January 10, 2018. ^ Gelman, Vlada (February 24, 2011). "Adam Reed". The A.V. Club. Archived from the original on January 10, 2018. ^ "2010 Gold Derby TV Awards". Gold Derby. Archived from the original on January 15, 2018. ^ "Logo announces winners for this year's "NewNowNext Awards"". Logo TV. June 18, 2010. Archived from the original on January 15, 2018. ^ "Annie Awards 2011: Complete List of Winners". Gold Derby. Archived from the original on January 15, 2018. ^ Labrecque, Jeff (June 6, 2011). "'Archer' season premiere review: Is this the best (children) cartoon on TV?". Entertainment Weekly. Archived from the original on January 15, 2018. ^ "Annie Awards 2012: Complete List of Nominations". Gold Derby. Archived from the original on January 15, 2018. ^ Harp, Justin (March 6, 2012). "The Comedy Awards 2012: Nominations in full". Digital Spy. Archived from the original on January 15, 2018. ^ "Critics' Choice TV Awards: 'Homeland', 'Community' & 'Sherlock' Double Winners". Deadline Hollywood. June 18, 2012. Archived from the original on January 15, 2018. ^ "40th Annie Award nominees and winners list". Los Angeles Times. February 2, 2013. Archived from the original on January 15, 2018. Retrieved January 4, 2018. ^ "Winners of the 3rd Annual Critics' Choice Television Awards". Broadcast Television Journalists Association. June 10, 2013. Archived from the original on January 15, 2018. ^ "2013 Gold Derby TV Awards". Gold Derby. Archived from the original on January 15, 2018. ^ "41st Annie Awards (2014)". ASIFA-Hollywood. Archived from the original on January 15, 2018. ^ "Winners and Nominees from the 4th Annual Critics' Choice Television Awards". Broadcast Television Journalists Association. June 1, 2015. Archived from the original on January 15, 2018. ^ "66th Primetime Emmys Nominees and Winners". Academy of Television Arts & Sciences. Archived from the original on January 15, 2018. ^ "2014 Gold Derby TV Awards". Gold Derby. Archived from the original on January 15, 2018. ^ "42nd Annie Awards (2015)". ASIFA-Hollywood. Archived from the original on January 15, 2018. ^ "Critics' Choice TV Awards Winners: The Full List". Deadline Hollywood. May 31, 2015. Archived from the original on January 15, 2018. ^ "67th Primetime Emmys Nominees and Winners". Academy of Television Arts & Sciences. Archived from the original on January 15, 2018. ^ "Nominees and Winners". Academy of Television Arts & Sciences. Archived from the original on January 15, 2018. ^ "Complete list of 2016 Emmy nominations and winners". Los Angeles Times. September 18, 2016. Archived from the original on January 15, 2018. ^ "'Archer' Scavenger Hunt, '@midnight,' Among Interactive Media Juried Emmy Winners". The Hollywood Reporter. Archived from the original on January 15, 2018. ^ Montgomery, Daniel (September 7, 2016). "Gold Derby TV Awards 2016: 'People v. O.J. Simpson' leads winners, 'Game of Thrones' & 'Veep' also prevail". Gold Derby. Archived from the original on January 15, 2018. ^ "The complete list of 2017 Emmy winners and nominees". Los Angeles Times. September 17, 2017. Archived from the original on July 14, 2017. Retrieved March 18, 2017. ^ Montgomery, Daniel; James Dixon, Marcus (September 6, 2017). "2017 Gold Derby TV Awards winners: 'Big Little Lies' and 'SNL' sweep, while 'Stranger Things' takes Best Drama". Gold Derby. Archived from the original on January 15, 2018. ^ Giardina, Carolyn (December 4, 2017). "'Coco,' 'The Breadwinner' Lead Annie Awards Feature Nominations". The Hollywood Reporter. Archived from the original on January 15, 2018. ^ Johnson, Zach (December 6, 2017). "Critics' Choice Awards 2018: Complete List of Movie and TV Nominations". E! News. Archived from the original on January 15, 2018. ^ "2018 Winners". The Webby Awards. April 24, 2018. Retrieved June 25, 2018. ^ McNary, Dave (March 15, 2018). "'Black Panther,' 'Walking Dead' Rule Saturn Awards Nominations". Variety. Archived from the original on March 15, 2018. Retrieved March 15, 2018. This page was last edited on 16 April 2019, at 16:39 (UTC).